This product has been discontinued. Recommended replacement is 999-85100-000 CeilingMIC Microphone. See complete notification in Documentation tab. 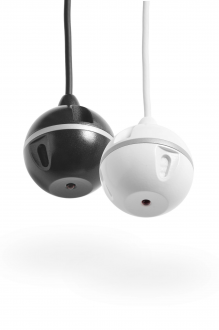 EasyMic Ceiling MicPOD microphones deliver professional audio quality into your PC system. 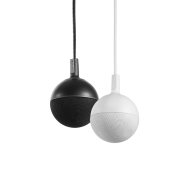 Each MicPOD delivers the performance of three microphones built into a single pendant hanging enclosure. With ultra wide 360-degree pickup coverage, one MicPOD provides excellent coverage for an average size meeting room table. For larger tables, a second MicPOD provides additional coverage. Each microphone element is equipped with integrated echo cancelation and Digital Signal Processing, including compression, equalization, filtering and AGC or automatic gain control. Because of the plug-and-play design, installation is as simple as connecting Cat-5 cable between the EasyUSB Mixer/Amp and the EasyMic microphones. Power, control and audio are all incorporated into the single cable.